Global conductive polymers market expected to reach USD 7,210 million in 2025, growing at a CAGR 7.5% between 2017 and 2025. Conductive polymers form a part of organic polymers showcasing thermal and electric conducting properties. Conductive polymers are a new class of polymers having characteristic electrical and optical properties similar to that of metals and inorganic semiconductors. One of the key advantages of conductive polymers is that its electrical, physical and chemical properties can be tailored depending on the application. Moreover, all of the above properties of conductive polymers can be altered and controlled through stimulation. Conductive polymers have large-scale applications in microelectronics industry vis-à-vis light emitting diodes (LEDs), batteries, photovoltaics, and displays. 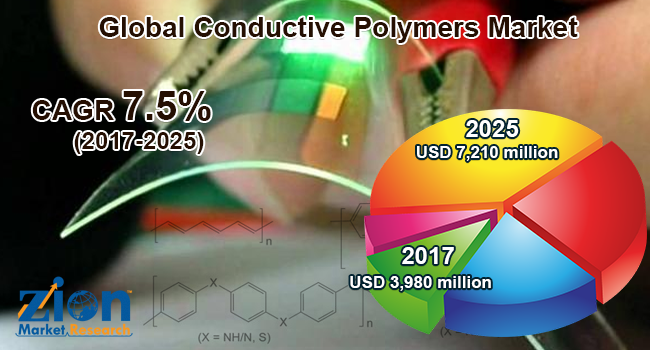 Global conductive polymers market is driven by advancements in biomaterials, rising demand for display devices, growing demand for lightweight electronic components, availability of low-cost raw materials, new advances in electronics and electrical sectors, demand for lightweight electronic components, increasing demand for smart materials. Low degree conductivity of conductive polymers, poor selectivity of conductive polymers, falling prices of indium tin oxide, and manufacturers preference towards metal-based materials are the factors restraining the growth of conductive polymer market for the forecast period. Conductive polymer industry is segmented in terms of type and end users. By types, the market is classified as electrically conducting materials and thermally conducting materials. Thermally conductive polymer materials segment is estimated to grow with highest CAGR for the forecast period. The growth of thermally conductive polymers is propelled by rising demand for consumer electronics. The end-user segment within conductive polymer market is bifurcated in terms of automotive, healthcare, industrial, electronics, aerospace and others. Automotive segment is growing with highest CAGR for the forecasted period 2017-2025. The growth is largely driven by rising demand for hybrid electric vehicles/ electric vehicles. Conductive polymers are extensively used in vehicle heating systems, fuel systems and touchscreen devices in automobiles. Conducting polymer market in the Asia Pacific is estimated to grow with highest CAGR for the forecasted period. Growth amongst Asia Pacific countries is largely driven by thriving consumer electronics & automobiles market, and increasing investment in infrastructural development across residential & commercial properties. Key markets for conductive polymers within Asia Pacific regions are Indonesia, Thailand, China, and India. Likewise, North America and Europe are holding highest revenue share within global conductive polymers market for the forecasted period. The growth of conductive polymers in North America and Europe are driven by favorable government & regulatory guidelines, large-scale presence of original equipment manufacturers (OEMs), significant R&D expenditure and adequate infrastructure. BASF Inc., Celanese Corporation., Abtech Scientific Inc., 3M Company., Kemet Corporation., Polyone Corporation., Enthone Ltd., Hyperrion Catalysis International Inc., Eeonyx Inc are some of the key players within global conductive polymers market.